The visibility in Ulong Channel isn't near as good as the outer reefs, especially when the tide is changing, but that's part of the allure of diving it. With such sights as schooling sharks, turtles, large formations of hard and soft coral and giant tridacna clams, there are more than enough sights and photo opportunities to keep a diver busy throughout a dive. Our dive began on an outgoing tide, and to take advantage of this and ensure a lazy, relaxing drift dive, our guide planned to drop us on the inside portion of the channel. After ensuring our "safety sausages" were securely attached, we rolled off the side of the boat, retrieved our cameras, and began what was to be an unforgettable experience. Our group of 5 descended 30' into the shallow channel almost directly on top of a turtle that was eating some soft coral. Surprisingly, it didn't spook. After taking a few pictures, we began moving down the channel. The bottom of the channel is predominantly sand, which explains the lowered visibility during tidal changes. It didn't take long before we had managed to separate ourselves from each other, and for the first 30 minutes of the dive I was kept company by my reliable dive buddy "Nikon". While exploring the large coral heads interspersed throughout the channel, I noticed what seemed to be a large number of rather large Triggerfish. Closer examination revealed they were mostly females guarding the eggs they had previously deposited. They were aggressive and didn't hesitate to charge me if they felt I was getting too close. Added to what amounted to "diving in a minefield" was the occasional surprise of encountering lone sharks as they appeared out of the gloom. In an attempt to relocate at least one of the other divers, I continually crisscrossed the channel. As I worked my way down the channel, I would often pause to admire the absolutely fantastic and extremely large soft coral formations. About midway through the dive, I "found" Dave investigating a couple of large Sea Anemones and playing with the Clown Fish within them. I was relieved to see him, if for no other reason than knowing he was OK. In the never ending search for photo subjects, we continued crawling over and under all the coral formations we could find as we crisscrossed our way down the channel. At one point, Dave and I were moving between two large coral formations with Dave about 15 feet in front of me. As Dave passed the end of the coral, I looked down and could believe my eyes. I immediately started yelling through my regulator trying to get Dave's attention. I was eventually successful, and once I was able to get Dave to recognize what he had just swam over, I could see the total surprise on his face. What we had encountered were two very large Tridacna clams. One was between 6-8 feet long, and the other was between 3-5 feet long. These were absolutely the largest living shells I had ever encountered. Working very hard to prevent any further reduction of the already poor visibility, I positioned Dave where I could get a couple of pictures of him next to the clams. Realizing that it was one of those "once in a lifetime" experiences, I wanted to get a CFWA shot of the mouth of the largest clam. Not only did I have to keep from stirring up any more sand, but I also had to keep from spooking the animal and having it close on me. I took me almost 5 minutes, but I eventually worked my way into position to get a photo. After taking one photo I had a small lapse in concentration and moved just a little too fast which caused the clam to close up some. Fortunately, both Dave and I had taken our fair share of pictures of the clams so we elected to continue our trek down the channel. Not much time had passed before there was an apparent increase in the number of Whitetip Reef Sharks in the area. We has passed 8 or 10 when we were suddenly in the midst of a school of Grey Reef Sharks. It was hard to count them all in the gloomy water, but I could make out at least ten within the limits of visibility. They seemed to be circling a small coral head looking for something; maybe they had already found something. I don't know. What I do remember is the school suddenly surrounding Dave and I and circling us for the next few minutes. Wanting to take advantage of a photo opportunity, but not wanting to agitate them further, I got as close as I dared and finished off the roll of film in my camera. What a rush! The sharks eventually dispersed and Dave and I completed the dive without any more surprises. Once back on the boat we found out just how lucky we had been on our dive. 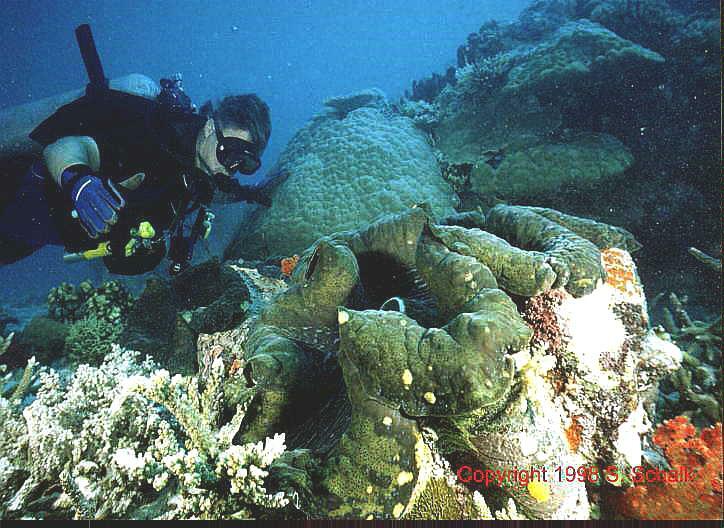 Dave and I had been the only ones to have seen the giant clams. Unbelievable!